From the billowing smoke of a vintage locomotive to watching the world leisurely pass by through a glass window, there’s nothing quite like the romance of train travel. Once upon a time, it was the primary way people got around the Lone Star State. 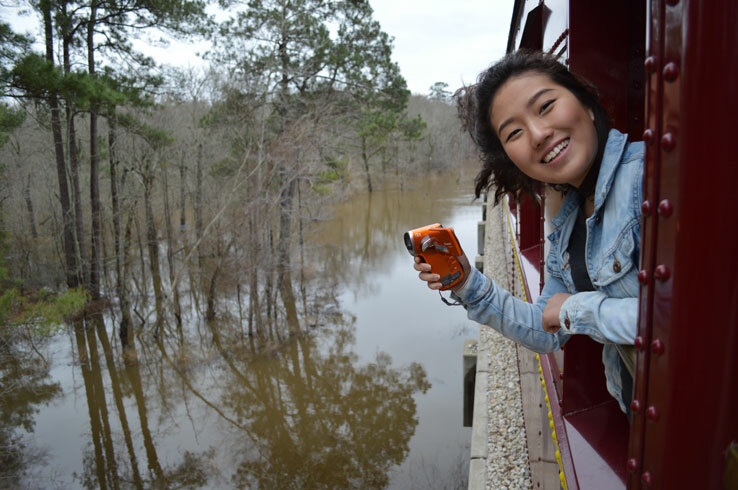 Although you won’t find this in most places today, you can still experience this when you ride the rails with the Texas State Railroad. The Official Railroad of Texas, the Texas State Railroad provides spectacular sojourns through beautiful East Texas on a 25-mile route between Palestine and Rusk. Kick back for a soothing journey that recalls the simpler times of a bygone era. Fun for riders of all ages, the Texas State Railroad is one of the top things to do in East Texas. Read on to find out why you should climb aboard the Texas State Railroad. You’ll probably hear it before you see it. The bellow of a whistle, followed by the sight of a vintage diesel locomotive or steam train rolling toward the old-fashioned platform you’re standing on. Pause for a moment and you may feel like a 19th-century traveler. Instead, this is just the start of your voyage with the Texas State Railroad. It all begins when you arrive at either historic depots in Rusk or Palestine, stunning destinations in their own right. 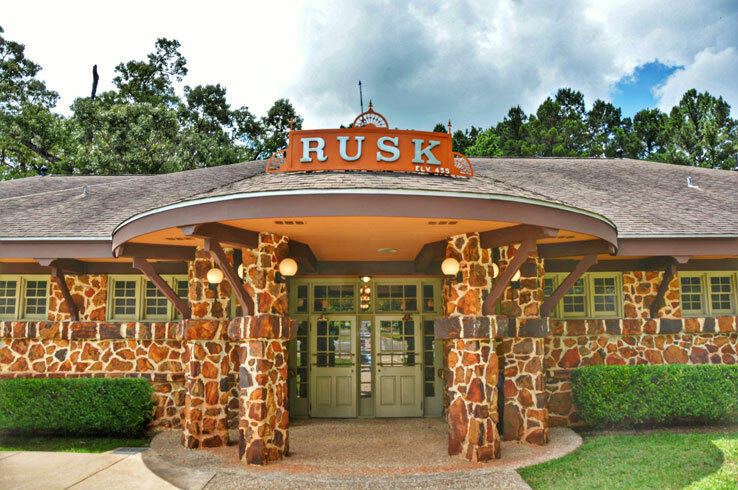 Both are home to gift shops and cafes, such as the Rusk depot’s Mail Car Café that’s located in an actual train car. Speaking of the Rusk depot, it doubles as a unique campground. Choose from the variety of campsites ranging from water only to full hook-ups with 50-amp service and sewer and take advantage of the depot’s amenities, including the restaurants, gift shop, and movie theater. The nearby 15-acre Cherokee Lake is also a great place to fish, as it’s abundant with largemouth bass, crappie, and catfish. While both depots have plenty of things to see, you’ll want to make sure to climb aboard before the train departs. Settle in for a four-hour, 25-mile excursion that runs between Rusk and Palestine. Breathe in the fresh air and enjoy some time away from the distractions of modern life as you listen to a narrator describe the East Texas flora and fauna and the history of the small communities you’ll pass along the way. Soak up the genuine hospitality and attention to detail, including your train car that looks as if it was plucked from the 1920’s, and order up some food and an adult beverage from the concession car. Once the train rolls into town, you’ll have an hour to stretch your legs and get some lunch before your trip back to where you started. What better time to see something you may have missed earlier in the day? The Piney Woods region is known for its blooming wildflowers, rolling hills, and verdant pine forests. While this undoubtedly creates a scenic backdrop for a road trip, it’s far better to experience it when someone else does the driving. Gaze out the window as you roll along tracks shaded by towering trees and bridges over tranquil creeks. Although the view can be relished year-round, each season affords its own surprises. Ride in the spring and you’ll see blossoming dogwoods and other vibrant flowers, while the fall paints the Piney Woods in awe-inspiring shades of orange, red, and yellow. Regardless of when you ride the Texas State Railroad, you’ll enjoy an escape to the great outdoors unlike anything you’ve experienced before. Just like travelers of old, you’ll have the chance to choose the kind of riding experience you want on the Texas State Railroad. Feel the fresh air as you settle in to the wooden bench seats in the open-air coach, or get a taste of historic train travel in coach class. For a more luxurious ride, opt for either first class, presidential, or the caboose. All three include service by friendly attendees and a champagne toast upon boarding along with their own perks. First class has more space than coach, as well as comfortable benches, drink service right to your seat, and access to an open-air car. The presidential and caboose cars go a step further, with intimate service, plenty of space to relax, and private viewing platforms. Last, but not least, you can fulfill that childhood fantasy of yours by choosing the locomotive ride-along option. 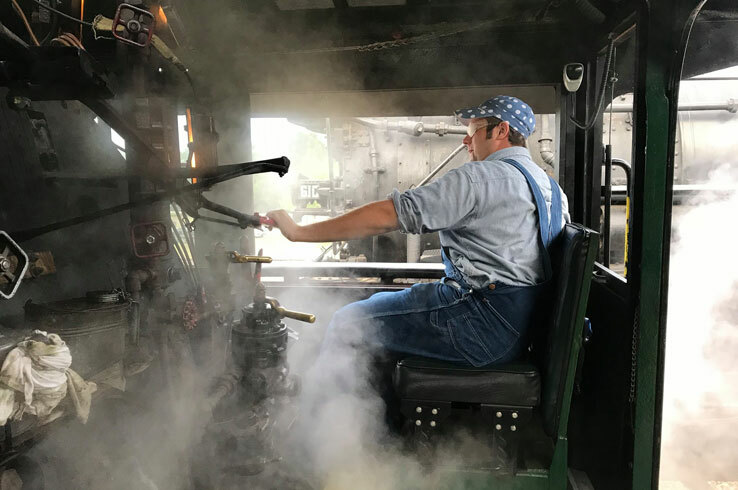 Get a first-hand look at how a train operates from your vantage point with the engineer and conductor in the locomotive. You may even get the chance to help prepare for departure. Let’s be honest; it doesn’t get much cooler than that. 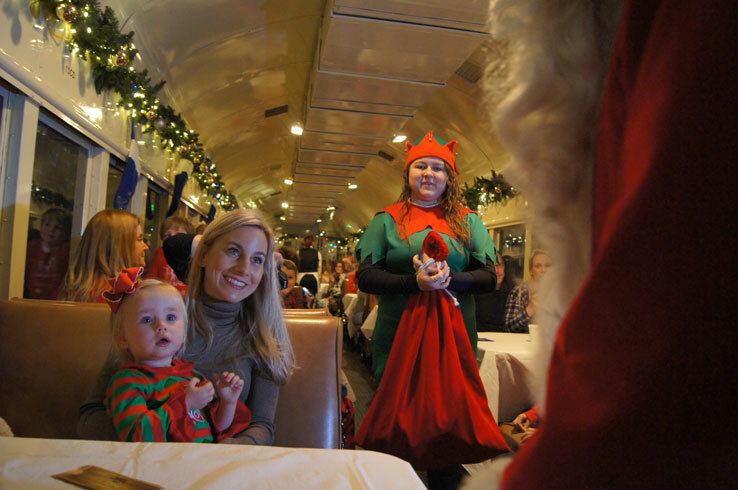 Embark on an unforgettable journey to the North Pole, ride a train to a park filled with Easter eggs, and enjoy other one-of-a-kind adventures on the Texas State Railroad’s special excursions. Perhaps the best-known excursion is the Polar Express Train Ride, a magical experience for kids that includes hot chocolate, cookies, and a silver sleigh bell from Santa himself. There’s also the Easter Egg Express and the Pumpkin Patch Train Ride, two seasonal events that your youngsters will love. The Texas State Railroad provides special rides for adults as well, namely the Chocolate Lover’s Special and the Saturday Night Romance on the Rails. All of these rides are worth experiencing, so make sure to plan ahead and get your tickets as early as possible. Although you might come to East Texas to ride the Texas State Railroad, you’ll want to stay to check out the two communities on its path. Palestine is best known for its blooming dogwoods, but that overlooks all the captivating historic architecture, diverse array of casual and sophisticated restaurants, and unique events like The 1836 Chuckwagon Race. Meanwhile, Rusk is a great starting point to some of the region’s coolest outdoor adventures. Soar in the canopy of a pine forest at Adrenaline Rush Zip Line. Then get an unparalleled view of such animals as capybaras, camels, llamas, kangaroos, and other exotic creatures as you cruise through Cherokee Trace Drive-Thru Safari. 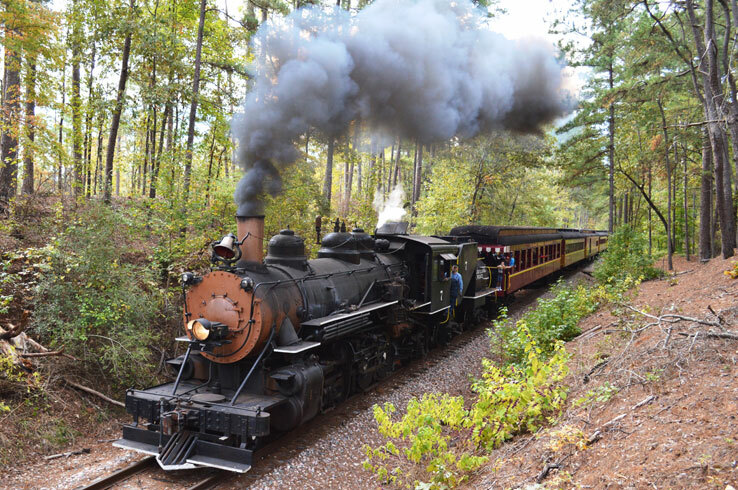 Ride the Texas State Railroad, then take time as you explore this corner of the Piney Woods. Who knows what you’ll discover?